Study Medical Photos: A 4 Year Old Child Presents With Recurrent Respiratory Infections, Ataxia And Telangiectasia. Answer: Presence of telangiectasia of the bulbar conjunctiva and development of gait problem probably ataxia and recurrent respiratory infections all point to the most probable diagnosis of Ataxia telangiectasia. Extra-pyramidal dysfunction is present but there is no pyramidal tract involvement. There is telangiectasia of bulbar conjunctiva and skin. 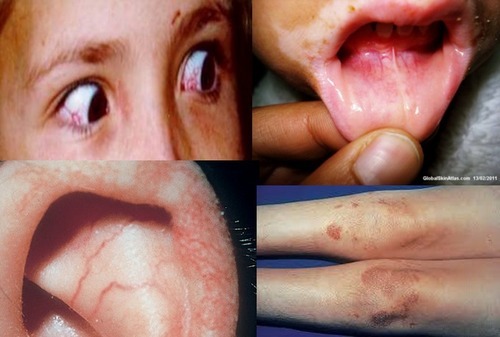 Characteristic telangiectasias develop at about 3 years of age, first on bulbar conjunctiva and later on the nasal bridge, malar areas, external ears, hard palate, upper anterior chest, antecubital fossa and popliteal fossa. Answer: Recurrent sino-pulmonary infections occur more commonly in these patients because of immunodeficiency (IgA) associated with it. Answer: In infancy it is noted that such infants cannot move eyes on command but involuntary movements are retained. This condition is known as oculomotor apraxia. Answer: There is increased likelihood of malignancies, as lymphoma and brain tumors in these children. It is slowly progressive. By adolescence, ambulation is independently not possible. Even mild dementia may be present in the later stage of the disease. Answer: It is transmitted as an autosomal recessive trait due to a mutation in the ATM gene.